Marked by an increase in blood pressure and high protein amounts in urine, preeclampsia affects up to 10% of pregnancies worldwide. Although in most cases, preeclampsia in pregnancy is mild and manageable, the risk of sudden, potentially fatal complications is very high. Continue reading to familiarize yourself with preeclampsia, its symptoms and diagnosis, and the ways you can reduce its effects on your pregnancy. 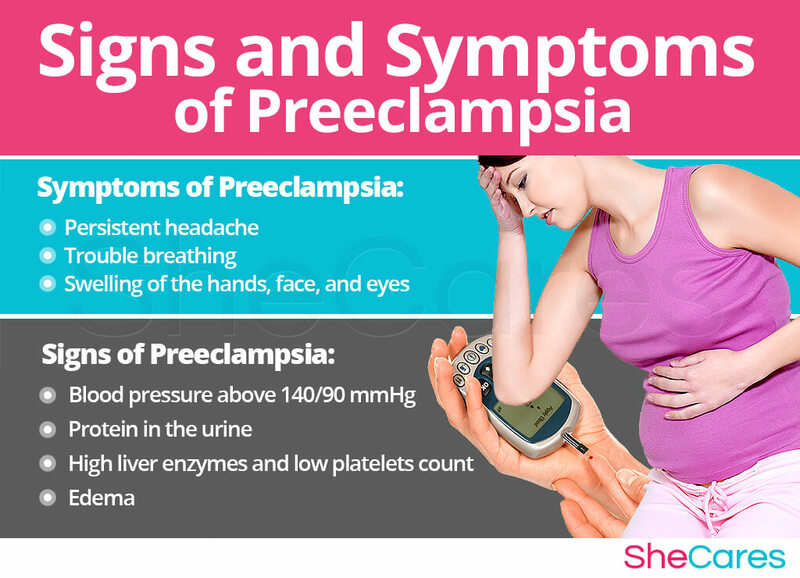 Preeclampsia is a condition that occurs when a pregnant woman develops high blood pressure (140/90mmHg and above) and protein in urine during late pregnancy, typically past the 20th week of gestation. A superimposed preeclampsia, on the other hand, is a term used to describe a condition when a woman with chronic hypertension develops preeclampsia during pregnancy. In the past, preeclampsia was called toxemia because scientists suspected that it might be caused by some sort of a toxin. This term is still in use in some countries today. 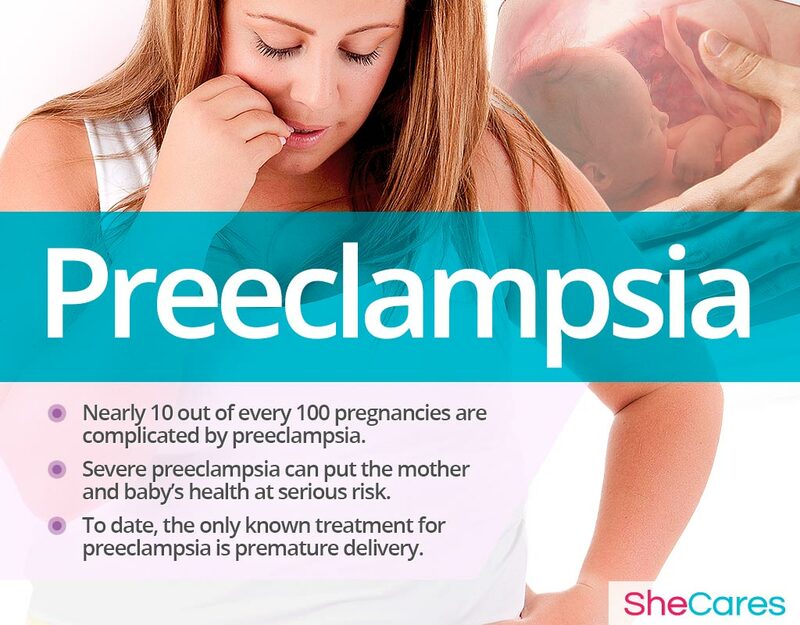 Developing preeclampsia in pregnancy can negatively affect both mother and her growing baby. 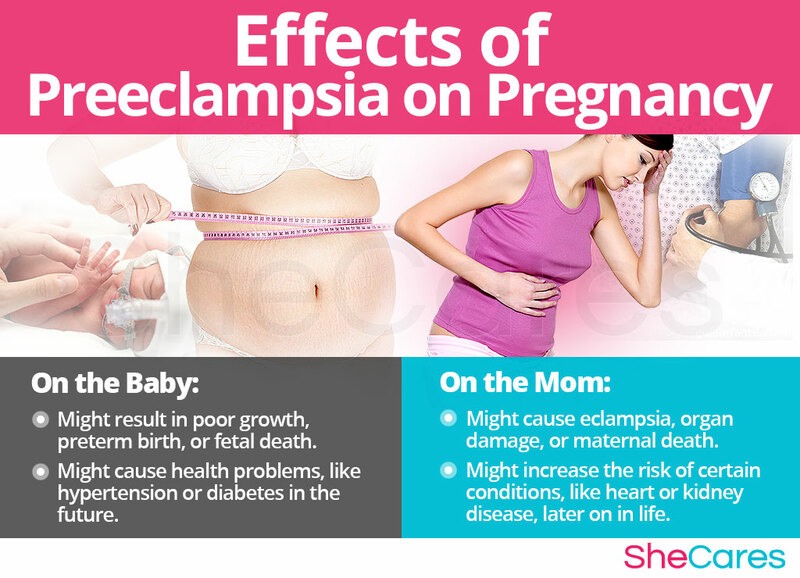 Severe preeclampsia can also compromise the health of the mother, causing eclampsia with seizures, damage to the liver, kidneys, and heart as well as stroke or even death. Women with a history of preeclampsia are also at a higher risk of developing heart disease, hypertension, diabetes, or kidney disease later on in life. Severe preeclampsia can result in placental abruption, HELLP syndrome, preterm birth, organ failure, and maternal and fetal death. Preeclampsia in pregnancy is diagnosed with a physical exam and medical tests based on various signs and symptoms. Blood tests are ordered to verify the levels of protein in the urine, liver enzymes, and platelet count. Non-stress test can monitor the baby's heartbeat and movement. Ultrasound can help monitor fetal growth and help decide if a preterm delivery is necessary. Managing your chronic health conditions before getting pregnant, especially hypertension. Reaching a healthy weight and maintaining it throughout pregnancy. Exercising regularly to maintain stable blood pressure and reduce stress. Quitting addictions, such as smoking or alcohol, before conception. Resolving any nutritional deficiencies, particularly selenium and potassium, and hormonal imbalances with hormone-stimulating supplements, like Macafem. Keeping a balanced, low-sodium diet composed of omega-3 fatty acids, calcium, and vitamins C, D, and E from various sources, such as low-mercury fish, eggs, whole grains, and green leafy vegetables. 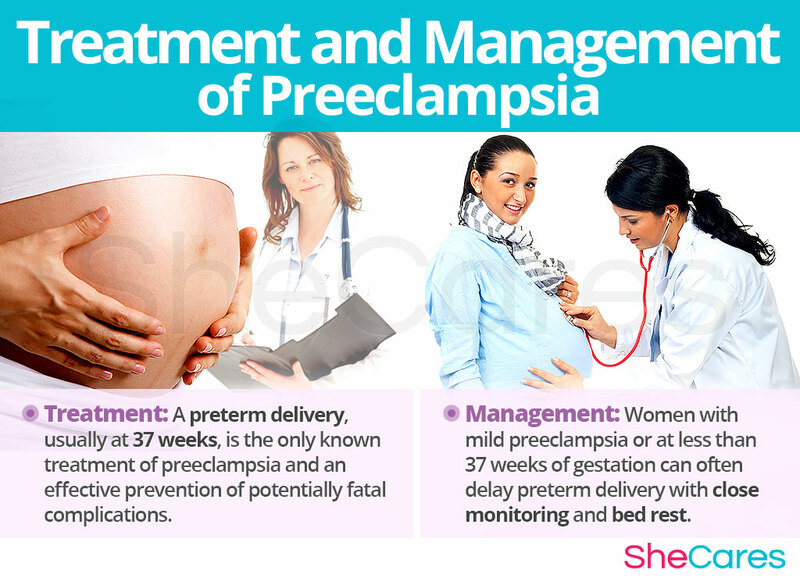 The only effective treatment for preeclampsia is delivering the baby to prevent further complications. If you are at 37 weeks of gestation or later, you might be given medications to induce labor or get a C-section. Sometimes preeclampsia is so severe that the baby has to be delivered as early as at 34 weeks. In most cases, the signs and symptoms of preeclampsia disappear within six weeks after delivery. You are more likely to develop it in subsequent pregnancies, but usually, it is less severe. Preeclampsia is undeniably a serious pregnancy complication, responsible for up to 15% of maternal and 10% of fetal deaths around the world. Fortunately, ever progressing medicine continues to discover more effective ways to prevent preeclampsia from interfering with the natural progression of pregnancy and enable women to bring their babies safely to term. Moreover, keeping wholesome lifestyle habits, like a balanced diet, healthy weight, and daily physical activity can effectively aid in preeclampsia prevention.